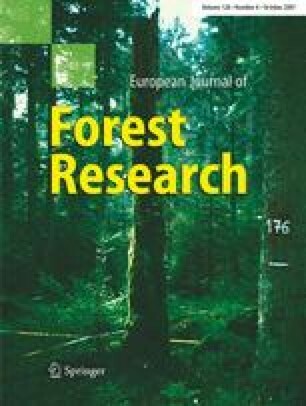 The purpose of this study was to compare the beta, Johnson SB, Weibull and truncated Weibull functions in describing the diameter distributions of forest stands in Catalonia. The data consisted of permanent sample plots from the Spanish National Forest Inventory in Catalonia. The empirical data represent left-truncated distributions, as the smallest diameter measured in the field was 7.5 cm. A total of 1,242 plots were used to fit the functions and analyze their performance. The distribution functions were fitted to the diameter distributions of the number of stems (DDN) and stand basal area (DDG). The performance of the candidate functions was compared by means of their bias and RMSE for different diameter sums measuring the difference between the empirical and fitted distributions. The leftmost part (from 0 to 7.5 cm) of the non-truncated functions was ignored in this analysis. Sensitivity analyses were conducted to check whether the results depended on the number of trees measured in the stand, or the main species of the stand. The truncated Weibull function for the diameter distribution of stand basal area appeared to be in all cases the most accurate and consistent function. Generally, functions describing the distribution of stand basal area performed better than functions that described the distribution of the number of trees. Of the basal area distributions, beta and Johnson’s SB were the second best and nearly equally good with each other. The order of precision of the tested functions was: truncated Weibull for DDG, truncated Weibull for DDN, Johnson’s SB for DDG, beta for DDG, beta for DDN and Weibull for DDG, Weibull for DDN, and Johnson’s SB for DDN. This study has been conducted within the research project AGL2004-00382 funded by the Ministerio de Educación y Ciencia of Spain, Secretaria de Política Científica y Tecnológica.